Two hooded men enter the Lanyon Vikings Club on 2 October 2017 after headlights flash in the car park. 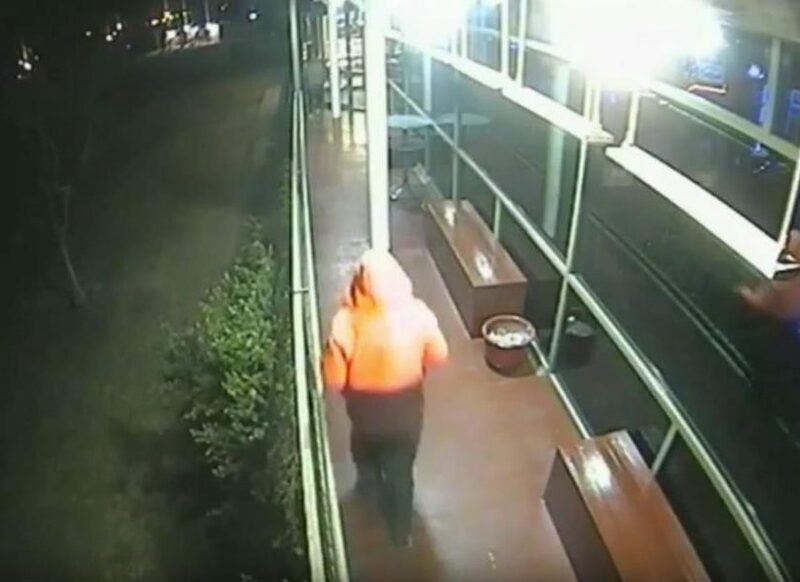 ACT Policing has released CCTV footage of a suspicious vehicle flashing its headlights which may be linked to an aggravated robbery at the Lanyon Vikings Club in Conder last year. Earlier this month, police said they believed 14 aggravated robberies and burglaries committed across the ACT in the last decade had been committed by the same “violent, greedy thugs”, and now they are seeking information about a car seen in the vicinity around the time of the Vikings robbery on 2 October 2017. Police said that about 10:20 pm a vehicle parked in the club’s outdoor car park, and its headlights flashed at 11:27 pm. About 11:30 pm two men entered the club, one armed with a shotgun and the other with a nail gun. One offender remained just inside the door of the club while another ordered a staff member on to the floor. One of the men threatened another staff member and a sum of money was stolen. On 1 August, police said that after receiving information from the public they had identified a ‘critical’ link across five historic aggravated robberies in Canberra committed between 2009 and 2010, and they now believed a further nine incidents between 2016 and 2018 were also connected. Detective Station Sergeant Harry Hains told a media conference then that CCTV footage of the robberies had shown two or three offenders but officers were not sure how many people were involved and he believed they were still at large. He said the offenders had used guns, knives and modified nail guns across the 14 robberies, some of which had yielded them more than $80,000. Police are urging anyone who may have any information about the vehicle, the driver or the aggravated robbery that could assist police to contact Crime Stoppers on 1800 333 000, or via the Crime Stoppers ACT website. Please quote reference 6283658. Information can be provided anonymously.